Richie Emmerson (tenor sax) Kevin Eland (trumpet) Rick Laughlin (keys & synthesizer) Keith Peberdy (bass) and Stuie Ellerton (drums). The Quintet, comprising of local musicians, maintained the high standards of guest bands at Dormans Jazz Club with an impressive performance, starting the evening with Wes Montgomery's Road Song followed by Good Bait and a fine version of a favourite one of mine Freddie Hubbard's Up Jumped Spring. The ballad, Young and Foolish, featured Kevin showing his great skill on flugelhorn. After playing Speak Low bebop style, the first half was finished off with a very moving Chuck Mangione number Hill Where The Lord Hides with great solos from all of the band. Cantaloupe Island started the second half off in style and then a fast John Coltrane blues Mr.PC. Richie on tenor sax was featured in a beautiful My Funny Valentine with Rick demonstrating his talent on keys and synthesizer before the band finished the night with The Hustler. 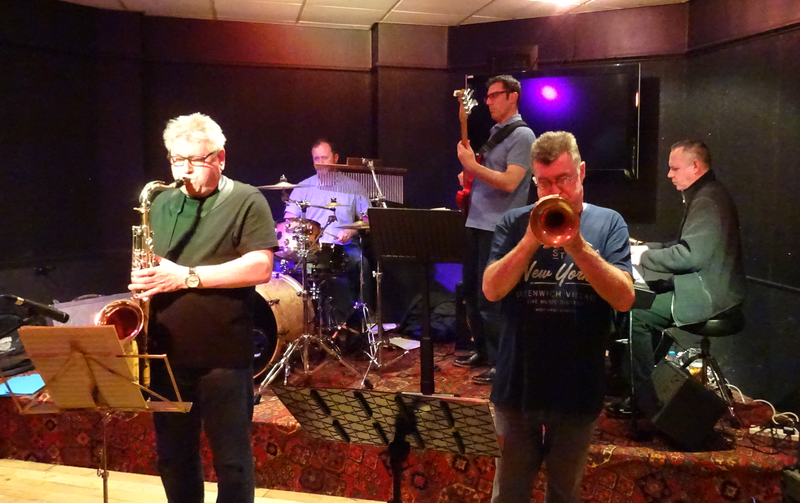 It was a pleasure for the audience to be treated to an evening of this fine selection of Jazz numbers played by Body and Soul helping to keep the Jazz night going at Dormans Club.